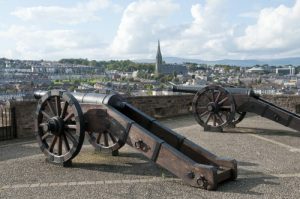 The city of Derry, Doire or Londonderry is Irelands only remaining walled city and offers 1500 years of social, cultural and religious history. 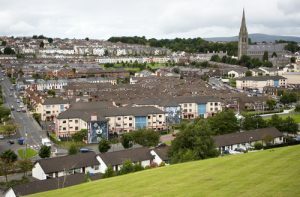 Derry was initially a monastic settlement, which became a plantation town and in later years it was a center port for emigration to America, Australia, England and Scotland. Derry is still making history as the opposing communities continue to work together towards a lasting settlement of disagreements. From a bank of trained guides one expert guide Mr John McNulty will recount stories of Irish emigration to America and local Irish history. A tour with John is not to be missed. His wealth of knowledge on these subjects will be of benefit to those seeking information on the people and city of origin of local emigrants, possibly your forebears. In common with many areas of Northern Ireland and indeed the world this city has witnessed a recent turbulent past. 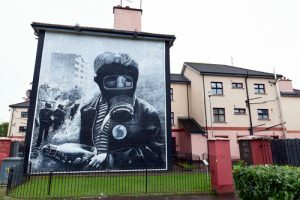 On this expertly guided tour you will walk around the Bogside, which in 1972 became the focus of world news with the worst ever atrocity to hit a European city since WWII on what has been named “Bloody Sunday”. Your guide will recount in detail the events of that day and the subsequent result of the initial inquiry. The second Bloody Sunday Inquiry finished in 2006, and is awaiting its conclusions. Derry is divided physically by the river Foyle and culturally by hundreds of years of conflict by two opposing religions. Experience this divide by touring the wall mural sites in the city side and the Waterside. The artistry of these murals is magnificent in itself but they also make a religious or political statement, which your tour guide will explain in a non-biased and factual manner that will not offend the sensitivities of either side. This tour offers you the visitor a chance to see for yourself the divide that has become so renowned worldwide and that is also part of a city on the verge of a new beginning.